The Rev. 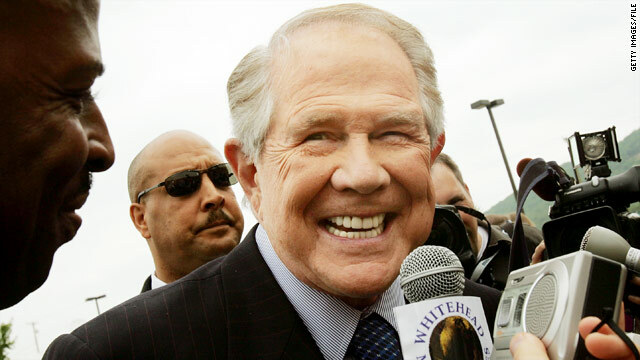 Pat Robertson - a longtime fixture in Christian conservative politics - is drawing attention for questioning an article of faith among many Republicans: mandatory prison sentences for certain marijuana-related crimes. Some pot legalization advocates noted that Robertson also appeared to question the criminalization of possession of small amounts of marijuana - a position later denied in a written statement released by his media outlet, the Christian Broadcasting Network. "It got to be a big deal in campaigns," Robertson said on the December 16 edition of his show "The 700 Club." "Lock 'em up, you know. That's the way these guys ran, and they got elected. But that wasn't the answer." Robertson said there is "something else we've got to recognize. We're locking up people that take a couple of puffs of marijuana and the next thing they know they've got 10 years. They've got mandatory sentences and these judges just ... throw up their hands and say there's nothing we can do." "We've got to take a look at what we're considering crimes and that's one of them," Robertson added. "I'm not exactly for the use of drugs. Don't get me wrong. But I just believe that criminalizing marijuana, criminalizing the possession of a few ounces of pot and that kind of thing, it's costing us a fortune and it's ruining young people." They go into prison "as youths and they come out as hardened criminals, and that's not a good thing." Chris Roslan, a CBN spokesman, insisted Thursday that Robertson "did not call for the decriminalization of marijuana. He was advocating that our government revisit the severity of the existing laws because mandatory drug sentences do harm to many young people who go to prison and come out as hardened criminals." The famous television pastor "was also pointing out that these mandatory sentences needlessly cost our government millions of dollars when there are better approaches available. ... Dr. Robertson unequivocally stated that he is against the use of illegal drugs." Roslan noted that Robertson's remarks followed a CBN story about the value of faith-based prisoner rehabilitation programs. Robertson, who has made a number of controversial statements in the past, used his television presence to become a major power broker in GOP politics for a period of time. He ran for the Republican presidential nomination in 1988, stunning observers by finishing ahead of then-Vice President George H.W. Bush in that year's Iowa caucuses. Most conservative officeholders continue to back both strong anti-drug laws and mandatory prison sentences for certain crimes. Some, however, have questioned the value of such stances, particularly in the wake of rising prison populations and expenses. Some conservative libertarians - such as former New Mexico GOP Gov. Gary Johnson - have called for the legalization of marijuana. A ballot initiative in California this year would have allowed adult possession of small amounts of marijuana. The measure was defeated by a 54-to-46 ratio. regardless of what this guy has said in the past, what really disturbs me is how quickly the media says his "remarks caused a stir" as if implying that he said something terrible. MARIJUANA IS A PLANT we have outlawed nature, how stupid is that? you people say it would "promote a brain dead society" actually its quite similar to alcohol accept with far more health benefits. wake up and stop being a moronic slave to government propaganda. http://evilbloggerlady.blogspot.com/2012/03/pat-robertson-says-legalize-pot.html Is it chilly in hell today? These have got to be some of the most misinformed. and BIASED, statements about the youth and recreational cannabis use I have ever seen. What's so harmful about a plan that grows NATURALLY in many parts of the world? The fact that it can be used to solve our economic crisis and potentially help turn it around? Or the fact that kids are getting more AWARE of how backwards our world civilization really is? Pot is not something that can be 'prayed' or whisked away by an affirmative smack on the wrist, it is a plant. Therefore it will never, EVER go away, and instead of deluding ourselves into thinking such, we should accept it and develop a strategy to put a STOP to the propaganda started by our leaders. There is nothing harmful about pot. However, if for the sake of argument, you want to include drug cartels, then by all means, do so. But don't act like it's not a problem we can't solve. If drugs were decriminalized and regulated pharmaceutically, then there would be NO drug cartels. You religious freaks have literally got to be the most closed-minded and foolish bunch I have ever encountered in my 18 years of life. There is no peace when there is no understanding, something which most of you religious fanatics seem devoid of. I hope your logistics and rationality aren't blinded by faith, too. I enjoyed reading this article and appreciate Rev. Pat Robertson's comments and thoughts on what happens to our youth when they enter prison or jail because of marijuana charges and then come out as hardened criminals. I may not agree with other positions he has taken in the past, but the fact remains he is a very well known conservative public figure. I commend him for speaking out on this issue. The more discussion that occurs the closer we can come to decriminalization, and when the conservatives are even looking at the pros this is very encouraging. He is not saying that marijuana should be legal, all you potheads took his words out of context. Pat Robertson is a smart man and would never advocate a drug that promotes a lazy, brain dead society. America is hurting enough we don't need to legalize marijuana and have everyone tripping all day. I think most of you are showing the effects of a brain on drugs. But, with the coming crash of the american dollar, you won't be able to afford them much longer. Maybe then you will able to think. It's too bad the world doesn't lock up all americans. You drug crazed fools in america don't deserve freedom. You financed the drug cartels with your recreational drug usage liefstyles. And now this man is suggesting to free you from jail. I say lets ship americans off to another planet, with no return spaceship. Wow. For all the people who claim to despise this man for his many, many, many evil comments and attempts to villify people for everything from small behaviors to natural disasters, you're pretty quick to accept him when he "gets one right." Did we forget this is the man who claimed Haiti's "deal with the devil" brought almost 250,000 deaths in the tsunami? Did we forget every gay is an abomination worthy of stoning? Did we forget his annual "speaking with god" from his far-off penthouse, from which he gives a "prophetic" prediction for the year to come? But he's okay now that he agrees a little pot isn't criminal worthy? Get ahold of yourselves. This man is as close to evil as it gets, and his liking pot won't save him. Marijuanna was and still is a basic part of western pharmacology, only now it is far more profitable for the rich. I understand his position; however, I'm hoping that in his speaking out, he'd advocate that folks not get "blazed" but remain sober and alert. Nggers love to smoke pot and deserve to be locked up. Sounds like Pope Pat's preparing everyone for a "revelation" in case he gets caught in the act. Hallelujahs! Jesus Christ!!! (this from an atheist) Common sense from a right wing christian Conservative preacher politician! There are certain conservative politicians whom I believe are sincere in their beliefs and actually care about the country and not getting re-elected such as Robert Dole, McCain etc but if you asked me before I read this statement from Robertson I would easily decline to believe he is one of them...........Now I am confused and find myself re-assessing him .......I get more moderate and willing to see the other perspective as I get older.......hope thats a good thing rather than my feeling more and more cynical at the same time about government in general......can anyone else identify or is it just me I wonder?